You’re invited to the 3rd Annual HEAL Haiti Fundraising Gala! 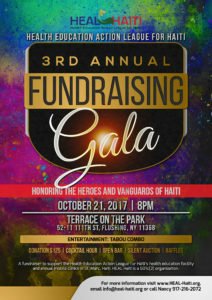 A fundraiser to support HEAL Haiti’s health education facility, education programs and annual health fairs in St. Marc, Haiti. HEAL Haiti is a 501 (c) (3).